We had a wonderful time chatting with Kayla Vee and getting to know this vivid hair color wiz! This silver-ash toning #GlossBoss tells us about her art and the impact SolaGenius has had on her brand! Secret Weapon: Silver- ash toner before dying hair. If you treat the hair with silver toner before dying it, it gives hair a holographic, metallic sheen. Beauty Obsession: Little known fact- I’m in love with cutting men’s hair. I had to stop because I got so busy with my own growing business, but I love doing men’s hair and undercuts. Inspiration: I’m always scrolling online. There are so many amazing people out there, some of who I have met in real life. It so inspiring when you get to meet some of the people you admire in real life. They are aren’t just Instagram people. They are down to earth and so willing to share formulas and tips with you. I got to meet Chris Appleton, who styles everyone from the Kardashians to Ariana Grande. He was so willing to share his trade secrets. You can follow him on Instagram at @chrisappleton1 ! Why She Chose To Start Her Own Business with Sola: I wasn’t really creating the looks I wanted. I felt too constrained by other people’s rules. I wanted to be able to have the option to be myself and create my own looks. When I was working under someone else, I never really felt like I could get to that level. Favorite look: The look that I’m most famous for- you may have seen it shared on the internet- is my unicorn topknot look. The topknot has deep purples and greens, with glitter cascading from the top. How this look came together was by chance. I was told to bring a model and it just kind of happened. It has been shared over 50 times. It’s gotten far more most buzz about it than I could have imagined in my wildest dreams. Why I am a #GlossBoss: I’m a #GlossBoss because SolaGenius freed up so much of my time by taking me from pencil and paper booking and spending all weekend reminding customers to show up, to freeing up all of that time through the text message campaign for me to meet more stylists in real life to get new tricks of the trade. SolaGenius even gives your customers directions to how to get your location. I love the text messages it allows me to enjoy my weekends. I really like everything about SolaGenius. I wouldn’t change to any other app. I love the website builder, it’s so cute and so easy. Sometimes people don’t know what service they are asking for, so having a website and putting up pictures definitely helps. Everything is so easy with the credit card scanner, you don’t have have to put in a new form of payment every time you see a client. All of the payment information is saved already. I also love the customer review section, I didn’t even know that was a thing. Some days I just go and read them. There are really so many simple and easy features that my clients and I love. GlossGenius’s impact on her brand: It has doubled and tripled my bookings. Every week when I get my report from SolaGenius about how my week stacked up, my bookings increase. It has also saved me tons of time and money on cancelled or forgotten appointments. Clients used to forget about appointments all the time since they were just written down. With the text message reminder system, over 95% of my clients show up right on time. This allows me to book more clients without worrying that I can’t fit everyone in due to cancellations. Also whenever someone new wants to book me, instead of having to deal with a million DMs, I can just point them to my website for scheduling. The website has also made keeping track of inventory of product so much more seamless. SolaGenius just makes my life so much easier and more organized. Off-duty: I love spending time at my salon. It feels like second home. 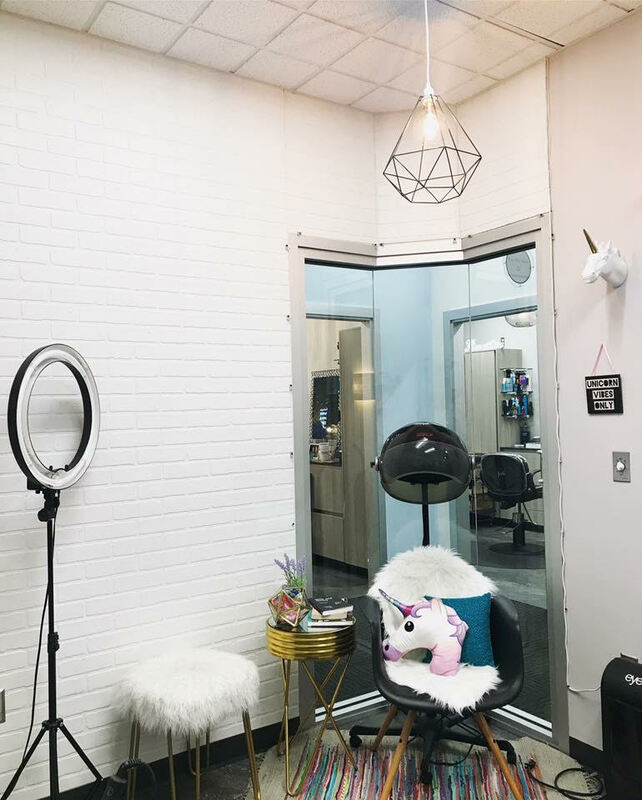 My fiance always asks why I’m never home, I just love being at my salon and styling it in a way that fits my personality. I was thinking about moving a bed in here. Thank you for chatting with us, Kayla! We rest assured knowing that your clients will show up for their appointments on time without fail. 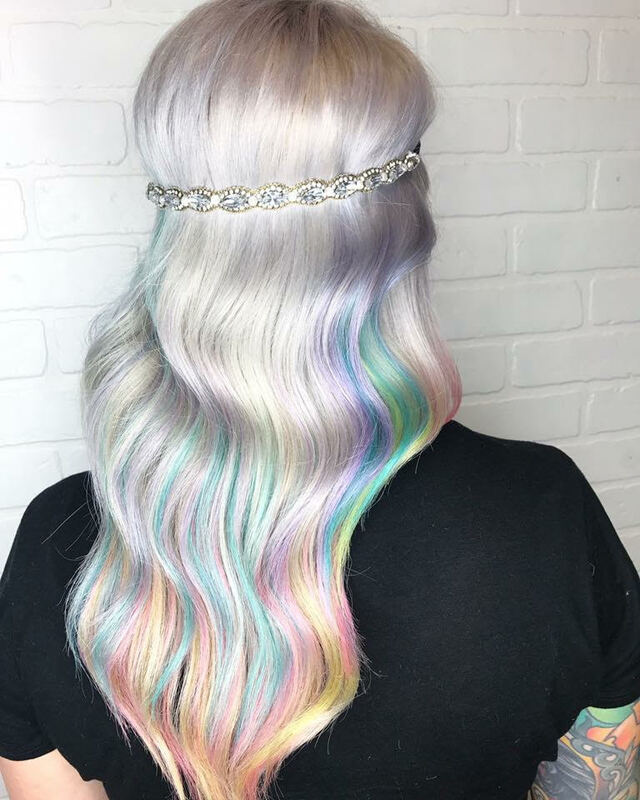 We look forward to seeing you create more dreamy unicorn styles! So glad you are part of the #GlossyPosse !